This login is only for INSPIRE partners to access the private area. The INSPIRE project is approaching its end date. It has almost been two full years. in this time the consortium made a great progress at helping industries appropriate suitable innovative business models. One of the goals of the project is to share the accumulated knowledge and transfer it directly to the industry. However, simply sharing the results is often insufficient – the results must be usable and understandable. That is why we have developed a set of tools to help industries find a solution/model that suits their needs best. One of the tools is a Business Model Innovation Game, which available at the download section of the website. The format of the game is a roleplay directed by a moderator. The essence of the game is to jointly redesign a specific case. The redesign is in line with the archetype related to the breakout theme and the redesign is directed to reshoring. 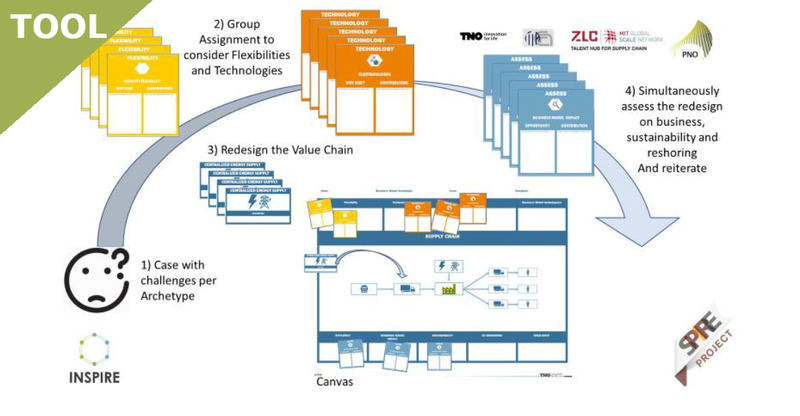 Acquiring the capability to redesign the business model of a specific case. Case-specific drivers and barriers to following up after the redesign. Considerations of participants (experts) in redesigning a business model. Opportunities and considerations of experts in reshoring. 20 validation of the business modelling concepts in their purpose to enable easy redesign of a business model. Download the game and reshape your Business model today!